The Abbi Agency has been chosen as the agency of record for Edgewood Tahoe, a luxury resort on the shores Lake Tahoe which was recently named by Travel + Leisure as the “Number One Resort Hotel in the Continental United States,” as well as “Hotel of the Year for United States & Canada” from Preferred Hotels & Resorts. 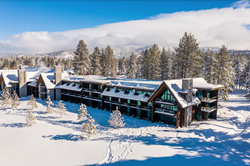 As Edgewood Tahoe’s Agency of Record, The Abbi Agency will assist the property in developing a comprehensive marketing strategy to officially introduce the property and its amenities to the public. The Abbi Agency will lean on the expertise of its various departments to execute a multichannel marketing communications program that will include social media, content marketing, digital and traditional marketing channels—cohesively plotted to a generate maximum return on investment for the resort, which has just entered its second year of operation. Edgewood Tahoe joins The Abbi Agency’s growing portfolio of luxury tourism marketing clients, which includes tourism business improvement districts like Carmel-by-the-Sea, North Lake Tahoe and Goleta, Calif., TravelNevada; economic development authorities and municipalities like The City of Henderson; as well as properties like THE ROW by Eldorado Resorts, Inc. The Abbi Agency’s leadership in developing integrated marketing communications programs for destination marketing clientele make the firm a particularly good match for Edgewood Tahoe. The team, which masterminded award-winning campaigns for its various destination clients (like the Poppy Award-winning Local Luminaries and the Hermes Award-recognized Goleta Style video series), intends to bring a robust marketing strategy to Edgewood that will continue to establish significant national recognition for the brand. The leadership at Edgewood Tahoe is similarly excited about the possibilities of The Abbi Agency and Edgewood Tahoe partnership. The Abbi Agency has already begun work with Edgewood Tahoe, publicizing the resort’s Travel + Leisure announcement through a multichannel marketing effort which saw the firm’s creative, social media and digital marketing teams come together to broaden the impact of the announcement and bring the brand top-of-mind for consumers. The firm is now developing a cohesive, fully-integrated marketing plan and creative campaign which will carry the brand forward for the long term. campaigns for clients including North Lake Tahoe, The Coalition to Save Our Schools and TravelNevada. The agency works extensively in the travel and tourism industry, while also growing robust technology, economic development and public affairs divisions of the company. Learn more at theabbiagency.com.